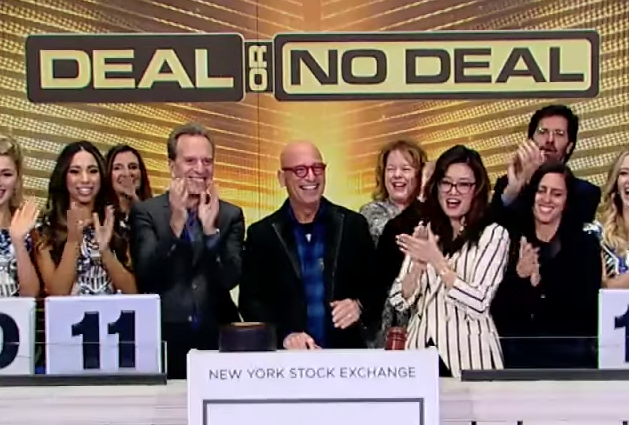 Mandel rang the stock exchange bell this morning in honor of “Deal or No Deal” being revived on the popular financial network CNBC. Mandel is both the star and the producer of the show. It’s real. That’s why I’m so thrilled to be a small part of CNBC. When we first did it in 2005 there are books on investment that have quoted, talked about, and studied what Deal or No Deal is. It’s risk versus reward. That’s ultimately what the stock exchange is about. How do you divvy up your portfolio? By the same token, when there is somebody sitting on our floor what do they do? How do you walk away? I said that Wednesday night. The guy said that on the first offer, “That’s half of what I make a year.” Would you invest half of your earnings in the stock market right now and go for it? Ultimately, there is no divine answer. What’s the big strategy on Deal or No Deal? What’s the big strategy on the New York Stock Exchange floor? Taking the big risk or playing it safe? It’s somewhere in between. But it’s also where you are in your life and what your needs are. With more risk, there is probably more reward, but can you afford to do that? What are you putting at stake for doing that? So when people walk away, like the first episode that actually aired during Christmas, there was a young man who had a wife and a baby and he played it risking it. All the way to the end he risked it. Two cases were left of $5 and $750,000, and an offer of $350,000 was on the board. There was an opportunity to negotiate. He said, “No Deal” and went All In and walked out with just $5. How many people have done this on this New York Stock Exchange floor right here? The trend with media is to be aware that it’s always changing. Whether it’s with Netflix, or whether it’s with some other digital or Facebook, how people and different sectors of our population are ingesting and buying into this there is not one answer. There may be an answer right this minute. Right now people are binge-watching on Netflix. Next year it could be Facebook or YouTube or ten-minute bites. I think we have to be kind of fluid and open.